Just recently had our VBS. The theme was "By the Sea". 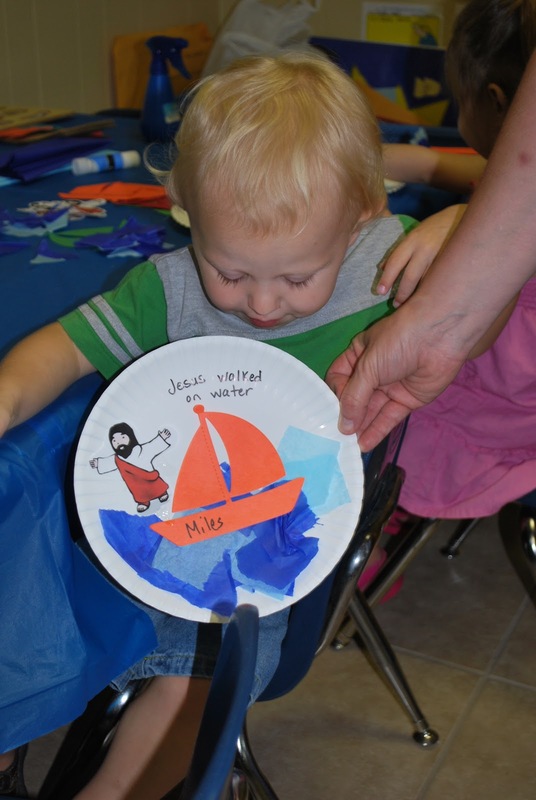 One of our lessons was Jesus walking on the water. Here are a few things we did in the 2 year old class. Made a very simple paper plate craft using tissue paper, boat die cut, and Jesus clip art. Ate blue jello with a teddy graham as Jesus. Was able to get the teddy graham to "walk on water" by "gluing" him to a pretzel stick with almond bark. Je-sus walked upon the sea. but the waves were everywhere. As with anything done by man, please be sure you read everything carefully to be sure it is in compliance with the Bible. Some of the links or books provided may have excellent ideas that you may need to modify so it will be in line with the Bible. Contact us for workshop infomation!